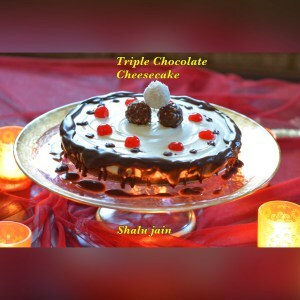 That too triple chocolate cheesecake!!!! !Starting your day with this will teleport you to cloud-nine!!!!! 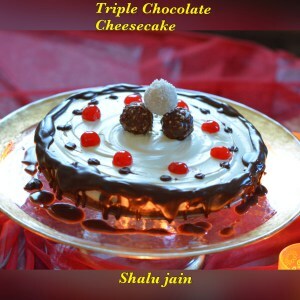 When, for a competition for my foodie group, I got the ingredient as chocolate, my mind was bursting to the seams with ideas. 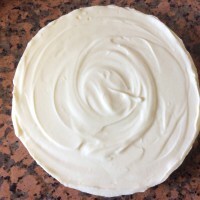 Then I zeroed-in on my hubby's favourite soft cheesecake, as he favours the softer versions over the traditionally dense cheesecake. 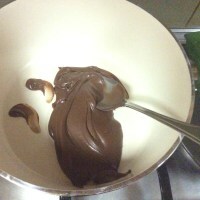 We will start by slightly thinning the Nutella by double boiler method. 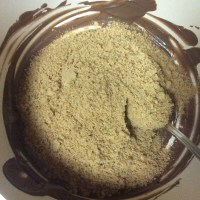 Place the Nutella in a small bowl/pan. 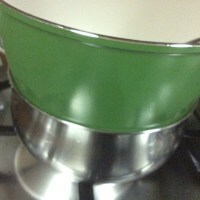 Place the bowl on a small pot with some water,placed on medium heat to boil. 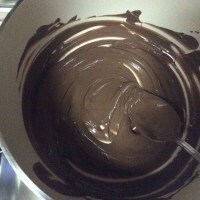 (Double boiler method). 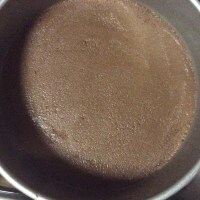 Continue on a soft boil for approximately 10 minutes or until the Nutella becomes quite thin. 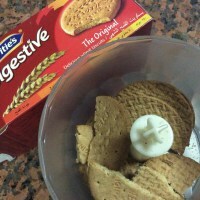 Remove from heat and mix with crushed biscuits. 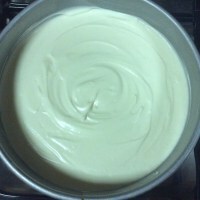 Place in the bottom of the Springform Cake Pan. 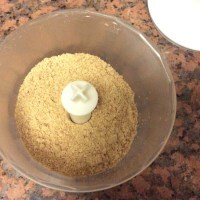 (Continue with the White Chocolate Filling while the crust is in the fridge). 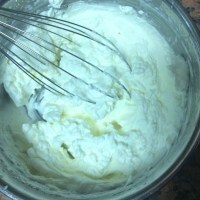 In a bowl whip the whipping cream and Icing Sugar. 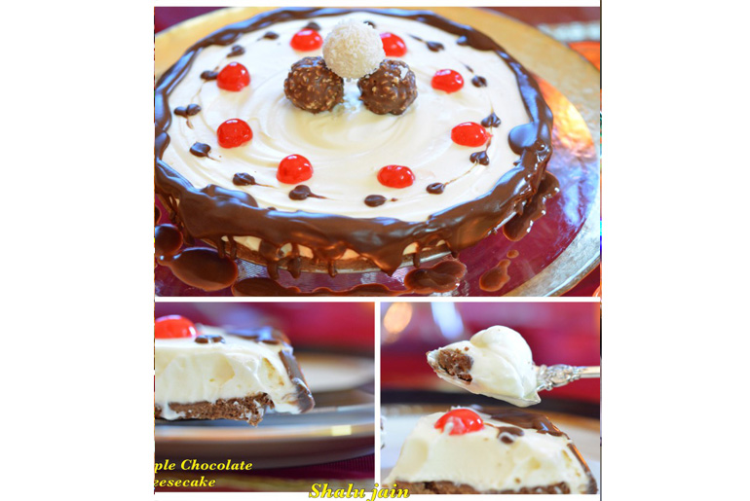 Melt the white chocolate the same way you melted the Nutella. 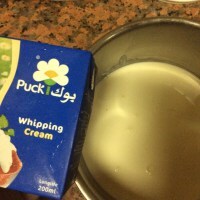 Let the white chocolate become cool. 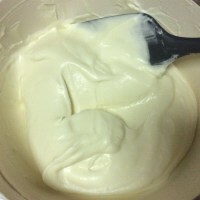 In a bowl beat together Cream Cheese and cooled White chocolate. 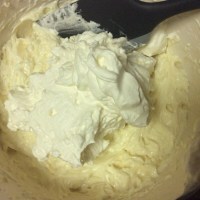 Fold in the whipped cream in the Cream cheese+Chocolate mix. 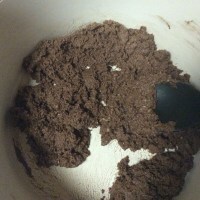 Pour this Cream Cheese Chocolate mix over the crust. 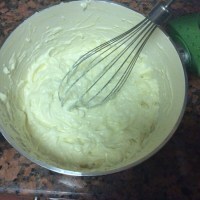 Keep it in the fridge for 5-6 hrs or Overnight. 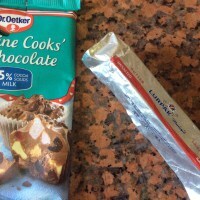 Break chocolate into chunks and place in a heatproof bowl. 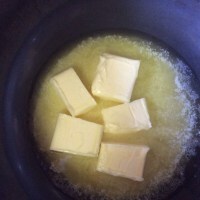 Pour hot butter over the chocolate and allow to stand for a few minutes. 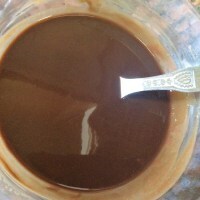 Stir until chocolate is melted and you have a lovely glossy and shiny mixture. 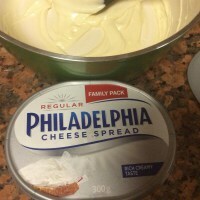 Cool until thick enough to spread on your cake. 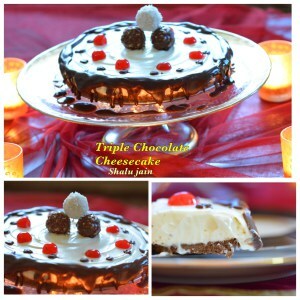 Drizzle over the prepared Cheesecake in the way you like.